ELeather is an award winning, environmentally friendly materials technology company offering a range of products, specifically engineered for interior and seating applications, to a diverse variety of sectors worldwide. ELeather products are designed and manufactured to provide exceptional characteristics delivering an eco-friendly material that out-performs traditional leather, synthetic leathers and fabrics. Using the process of hydroentanglement we combine traditional leather fibre and high performance core material to produce eco-engineered leather fibre composition upholstery. As public transport goes multi-modal, ELeather products help ensure passengers experience consistent quality, door-to-door, whatever the vehicle or destination. Ground breaking Leather Fibre Composite is engineered to deliver more, enriching the passenger experience through comfort and style, plus enabling a clean and hygienic journey time after time. Operators benefit from a technically superior product that’s high performance, low maintenance and sustainably smart. Being versatile to work with and available in any colour with multiple grains provides manufacturers and designers flexibility together with practicality. ELeather sets a new level in passenger experience; in the lounge, on the track and on the road. Many train operators and designers working within the ground transport industry are becoming increasingly aware of the impact that great seating design with inspiration for new and more innovative materials with more capability for modern design. 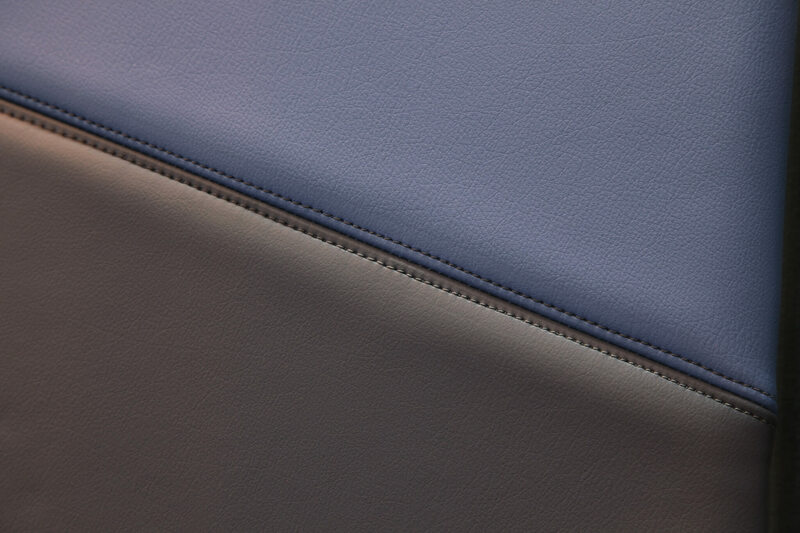 Leather Fibre Composite offers a unique, high quality product for rail interiors and seating applications that provide the luxury look and feel of traditional leather with the consistency of a man-made product. This enables seat builders and cut and sew companies a more reliable material to work with that dramatically improves the yield during production processes. The characteristics of ELeather products mean designers and operators can be more experimental with design by incorporating embossing, print and laminate, as well as other creative stitching, quilting and piping techniques. As passenger expectations for interior design, and the services they can access increase, operators may need to consider Leather Fibre Composite for more than just seating; cladding for walls, arm rests and even flooring are attractive possibilities. ELeather offers a number of high performance Leather Fibre Composite materials, specifically engineered for the Rail market. All products are highly robust and easy to clean, keeping maintenance costs low. Related Post: Milwaukee Composites Inc.
ELeather rail seating upholstery undergoes rigorous testing, including internal batch testing to quality check levels of flex and abrasion, plus more extreme comparison testing for UV aging, thermal aging and hydrolysis. We offer a wide range of stock colours for the rail market, as well as a colour match service for specific projects. ELeather are passionate about turning something that would otherwise be wasted into something that’s truly wanted. Up to 50% of traditional leather is unused and often destined for landfill. This inspired us to develop a unique, clean technology that produces a range of high-performance and highly desirable leather fibre composites. Our patented manufacturing process interlinks traditional leather fibres without the use of unfriendly adhesives that can be harmful to the environment. Furthermore, the process recycles 95% of the process water, and the waste streams are converted into energy which is fed back into the process. ELeather is a clean technology product with 100% zero carbon electricity in its production process. We are committed to making efficient use of the world’s limited resources and are proud to partner with winning brands that have the same ambition to look after the world we live in by recycling and reusing materials rather than treating them as trash.